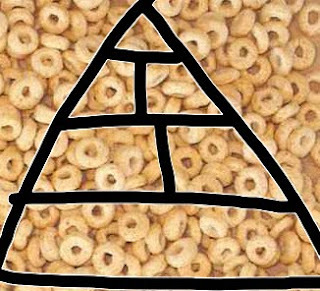 The first preschooler announces that Cheerios are in the Crust Group. The second student is sure the base of the food pyramid is the Brain Group. We've been talking about breads and grains. Preschoolers have been prejudiced against bread crusts for generations. I bet the prejudice goes back to the true crusts of home-baked bread, and was held over during the Wonder Years. The crust was often drier and more difficult for a youngster to chew. Still, it could be useful for leaving a trail away from an evil stepmother. Now, if you tinted bread crusts neon turquoise, added Sponge Bob zinger exploding crystals instead of oats and seeds, and packaged the entire sandwich in a plastic squeeze tube you would become famous. If you could freeze-dry it, then reconstitute it with added sugars, run a steam-roller over it, roll it up, get a celebrity endorsement movie tie-in, and package it in a single-serving plastic container with a tiny dollop of Ranch Dressing dip you would make a fortune.